A year ago in January 2016, my nephew, Jack, was diagnosed with Autoimmune Encephalitis. He developed symptoms very suddenly, a devastating and terrifying mix of psychotic behaviors, that resulted in him being taken first to Carolinas Medical Center in Charlotte, North Carolina, where he spent a week, and then by ambulance to Duke Medical Center’s Children’s Hospital in Durham. Autoimmune encephalitis (AE) was not formally defined as a disease until 2007. It was first recognized in 2005 by Josep Dalmau, MD, PhD, adjunct professor of Neurology at the University of Pennsylvania, when he identified a patient with anti-NMDA receptor encephalitis, now understood to be one of the most common forms of AE. Since then, as many as 20 types, each involving a specific auto-antibody targeting a different antigen within the body’s own brain tissue, have been discovered. AE causes psychiatric symptoms, delusions, memory loss, seizures, and involuntary movements. Prior to 2005, these symptoms could only be attributed to “psychosis”, and patients were treated with various anti-psychotic drugs. Today, if promptly diagnosed, AE can most often be successfully treated with steroids, intravenous immunoglobulin (IVIG), Retuximab, CellCept, and Cytoxan. During my nephew’s illness my personal interest in understanding what was happening to him, as well as my desire to help explain this to my anxious family, were motivation to research what I could about this extremely complex and confusing disease. As a medical illustrator, and one who is focused on patient education, I soon became aware of the complete lack of any clear visuals that might help patients and their families and I immediately started thinking about the need for some patient-friendly visuals that could be shared with family and colleagues. From personal experience I know that people who are suddenly confronted by this devastating illness in a family member, or in someone they care about, need as much help as they can get. AE is a very challenging illness to understand! My research began with learning more about the blood brain barrier and how this disease develops. Unfortunately, online resources were limited and images relating to AE were scarce. Those I found were too complex for an audience with little scientific background. I sought the help of my nephew’s doctors Heather Van Mater, MD, MS and William Gallentine, DO. They were enthusiastically supportive, and while Jack was receiving treatment under their care, they agreed to offer their expertise as consultants in exchange for being provided with educational images for the center’s Childhood Brain Disease Program website. The goal was to put these images on the CBD website to help patients and family have a better understanding of the science behind the disease. The first illustration in the series of visuals I created on AE, pictured above, explains “How the Immune System Works”. It shows the blood cells, and the molecular and tissue components involved in the development of inflammation in the brain. The image depicts part of the blood brain barrier (BBB which is shown below the blood vessel in the image). An understanding of the BBB is integral to an understanding of Autoimmune Encephalitis. 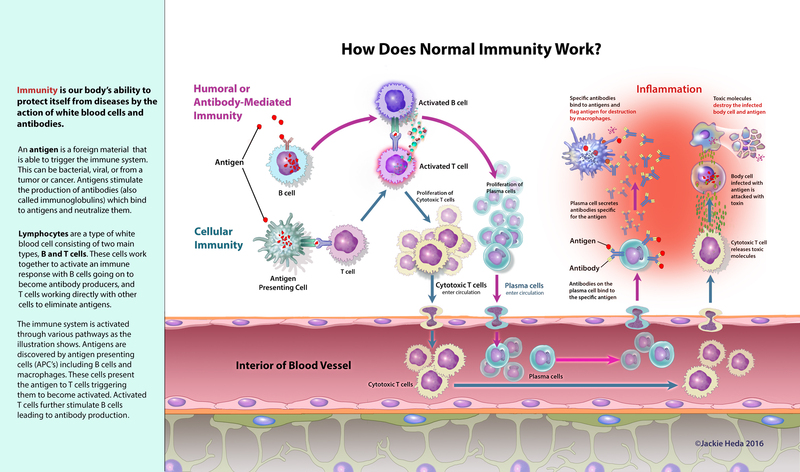 How does normal immunity work? How is the Brain Affected in Autoimmune Encephalitis?